Siegessäule [Victory Column], Berlin’s most widely distributed LGBT and arts magazine, described Germany’s popular gay stage and film actor, singer, and activist as “Homo movement legend, Diva, creative-fiery spirit Rita Dieter Scholl, who gives queer vocal performances.” Dieter Rita Scholl, who has also worked for the Goethe-Institut, the worldwide cultural association of Germany, was such a success at the Philadelphia Fringe in the past that the Bearded Ladies invited him back for a new program this year. In addition to entertaining the audience, he is also going to talk about the history of gay cabaret from the Weimar Republic to our own time. However briefly, he will also address the issue of the fragility of freedom nowadays. Henrik Eger: When was the first time that you recognized you were creative? Dieter Rita Scholl: In my childhood, around 6 to 10 years old, I did little performances as “the clown” on birthdays for my family and friends. My parents often visited the cinema and brought home the programs. Reading them, aged about 10 to 15, encouraged me to create little stories, even mini-screenplays with a lot of ideas for future films. I wrote everything down, gave them a title, and decided who was to play the main roles, for example Romy Schneider and Horst Buchholz [two mega film stars in Germany, 1950s-1980s]. In Freiburg, where I was born, I attended cultural events during some wild times in the 1960s, including Preparadise Sorry Now , a drama about fascism and revolution by Rainer Werner Fassbinder. I liked it a lot. Dieter Rita Scholl. Photo by Jens Schommer. Henrik: Tell us about your evolution as a gay man in Germany who was coming into his own. Dieter Rita: I spent my whole childhood and youth mostly with women: my mother, sister, and her twin-girlfriends. In kindergarten, I played with puppets and the girls. Somehow, I always felt a stranger in the world of boys, because I saw them as being aggressive and competitive. I was never interested in any of that. I spent most of my time with females till I turned 20 or 21. Yet, I have always been attracted strongly to boys and men during my school years. Then, during my studies for Social Pedagogics in Tübingen, I fell in love with other men, but because they were heterosexual, that lead to mostly complicated situations. After I completed my studies, my great love and I broke up. As a result, I started a public coming out campaign on stage. In 1979, a whole collective of 6 outrageous gay men from the alternative subculture and I opened a gay café in Hamburg, called Tuc Tuc. There, we worked together and also lived in a schwule Wohngemeinschaft—a gay commune. And after looking at Brühwarm [Hot, fresh off the press], a German gay emancipation ensemble, with their motto “Proud to be gay!” shouted in the streets, I witnessed the first Gay Pride Parade in Germany [Berlin 1979]. 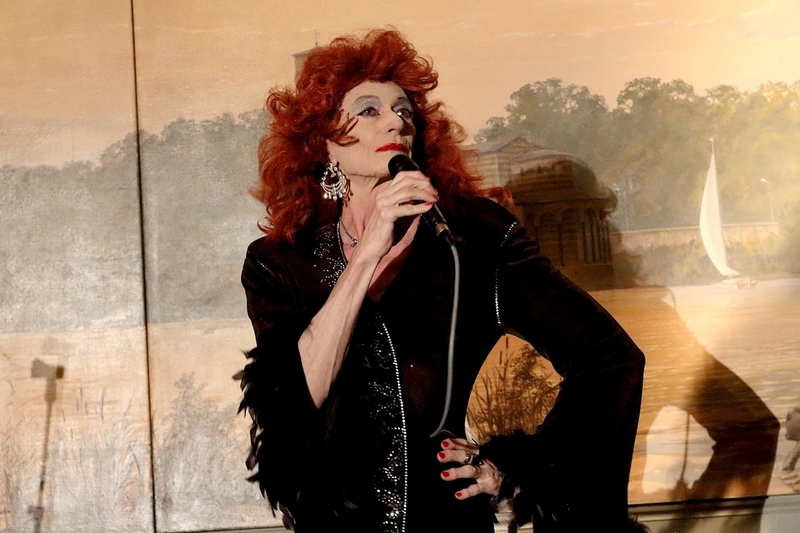 All of these events set my heart on fire when I saw the legendary Hot Peaches [a drag theatre company in New York City that put on a play a week—“political camp, dominated by drag”—active from the 1970s-1990s]. I knew right then and there that I wanted to express myself on stage and share my energy with the public. As a result, I started my first performances at our café. Henrik: How did your gay awareness encourage you to become a performer who went outside established norms? My base has been the underground, and so I’m not one to compromise. I stayed within that milieu for a long time. 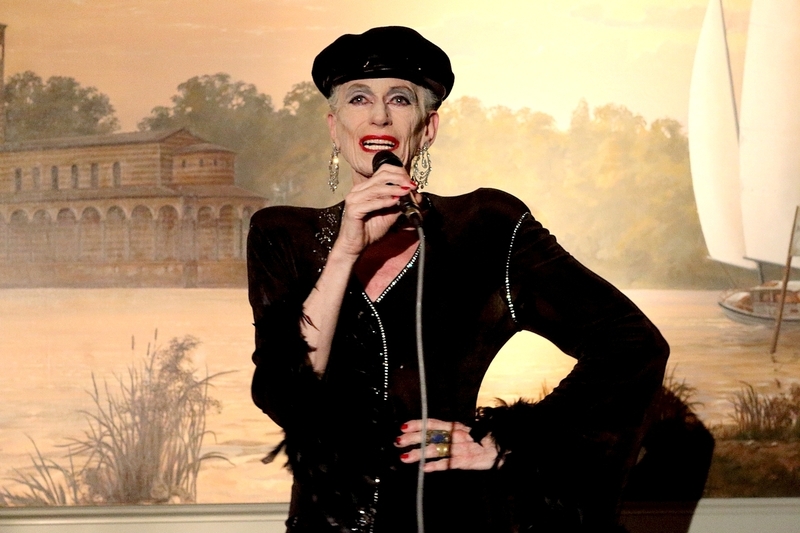 But from the beginning of the 1980s, I got a lot of roles in TV, mostly typecast as a “transvestite.” I also acted in feature films, for example Meeting Venus by Hungarian director István Szabó where I met the great Glenn Close, even though I only played small parts. That did change a little bit later. Recently, I acted in the Babylon Berlin TV series by Tom Tykwer, which takes place in Berlin during the Weimar Republic. I’m playing the part of Gloria in episodes 8 and 9. My best experience has been to work with the Mexican director Max Zunino. We did the film Bruma/Mist/Dunst and the shooting took place in Berlin for most of the time. We improvised all dialogues. To our delight, the movie was selected for the competition of the Guadalajara International Film Festival in March 2017—and I was invited to the opening night in Mexico City. But the greatest gift in that film, for me, is that I’m playing a real character and not just a stereotypical transvestite. The parts for which I get cast in this business are still constant and boring. That’s why I’m always looking for roles that challenge me. Another great gift has been the short music video Cold Star. Because it is available on YouTube, I got a real strong connection to the younger generation. Since then, directors from different countries—like Brazil, Columbia, Israel, and Mexico—have offered me parts in their short or feature films. Most of them are creative, kind, and full of ideas. Lovely! However, I never reached the mainstream, because of my dislike of a lot of things in the commercial film industry: not enough love and heart for what I want to do. Henrik: Why did you add “Rita” to your name? Dieter Rita: In 1979, I wanted a feminine name to express my inner life. Two women named “Rita” inspired me: Rita Hayworth because of her elegance, and Rita Moreno, the temperamental dancer in West Side Story. I like to combine, to find myself in the golden middle, knowing that the balance can be fragile. I’m against the “either/or.” For society it is always a question, “Are you this . . . or are you that?” I’m not “OR.” I’m “AND.” Yes, I’m man and woman—and all in-between. So everyone is welcome to call me Dieter, Dita, Rita, Dieter Rita, or whatever—all me! Henrik: How did your family respond? Dieter Rita: My parents at that time, around 1979, lived far away. It was complicated, especially with my father. After his death in 1982, my mother and I had better, more intensive conversations, because she no longer played “mother” and “wife”—she was more herself now. Henrik: What kind of shows do you do in Berlin and other cities? And how do audiences respond? 1. PARIS-BERLIN: Singing French and German chansons, trying to build a bridge between the 1920s and the present. Looking to Kurfürstendamm and Champs-Élysées with texts by Erich Kästner and Kurt Tucholsky. 2. ICH BIN WAS DU VERGESSEN HAST [I Am What You Have Forgotten]: Movie songs of the 1920s, 30s, and 40s—the stories of film stars like Asta Nielsen, Jean Harlow, Gloria Swanson, Louise Brooks, Greta Garbo, Tallulah Bankhead, and Joan Crawford. 3. DALIDA barfuss [DALIDA barefoot]. The tragic life story of Dalida, the famous French-Italian-Egyptian singer. I’m celebrating her life by singing her chansons. 5. LILA NÄCHTE [Lavender Nights] about the loss of Jewish life and culture with the arrival of the brown shirts, with texts by Mascha Kaleko and other victims of the Nazi dictatorship. Henrik: You performed on stage, singing chansons and bringing back part of the cultural life of the Weimar Republic, which the Nazis destroyed in 1933. Is there a growing audience for the art, culture, and music of that time in today’s Germany? Dieter Rita: In Berlin, they regularly show Cabaret [the 1966 musical and the 1972 film] as there’s a large audience for it. Also, at schools, teachers lecture frequently about the evil of the Third Reich. Some of the people who survived the ugly time talk about it to the students. And there are a lot of organized visits to the concentration camps. On the other hand, a lot of younger people say: “It’s enough! We don’t want to hear about the ugly history of Germany—again and again.” They want to feel comfortable with their German identity and not always have to express their sorrow and feeling guilty for something that happened long before they were born. In German culture today, you will find quite a few films presenting these issues. It is hard to decide, what the mood of the people in Germany is at the moment, with the same uncertainties in other countries. From my perspective, there’s not enough courage and humor in the German culture, but I may be too critical. Henrik: How did you connect with the Philadelphia Fringe, especially John Jarboe, the artistic director of Get Pegged? Dieter Rita: I remember an evening in Berlin in 2014, when John Jarboe visited Berlin while I was performing with the Queer Riot Club in an underground location. The next day, I visited a show at the Schaubühne Berlin, [the People’s Stage program, one of Berlin’s most famous theatres]. After the show, John found me and asked if I was the performer last night. We then met the next day and talked about cabaret in France and in Germany, the Bearded Ladies in Philadelphia, and my experiences in Berlin. John returned to Berlin in 2016 with Sally Ollove [dramaturg and director] to find out more about cabaret history in Berlin, like Isherwood’s Berlin Stories, Kabarett der Namenlosen [Cabaret of the Nameless], and Berlin’s queer club and cabaret scene before Hitler destroyed it. John interviewed performers and colleagues I had recommended. I also showed him interesting cabaret locations and we visited several clubs. He also attended the opening night of my performance of Lila Nächte [Lavender Nights]. He video-recorded everything. John then invited me to perform in Philadelphia for the Get Pegged show in 2017. I lived in his apartment for nearly four weeks. Last year, I got invited again for the Get Pegged show—a nice experience. However, I did not get the visa for the workshop in May. Henrik: Why would a citizen of the EU have trouble getting a visa to the US in 2018? Dieter Rita: The Bearded Ladies had applied for my visa [to work on the Fringe show Do You Want a Cookie?]. Perhaps the officer who worked on it did not see a reason to give permission to a German chanson singer for an evening in praise of cookies. Perhaps he didn’t know the sarcastic meaning behind the expression, “Do you want a cookie?” Immigration officers usually don’t give you any reasons. Henrik: What will you be performing at the Fringe this year? 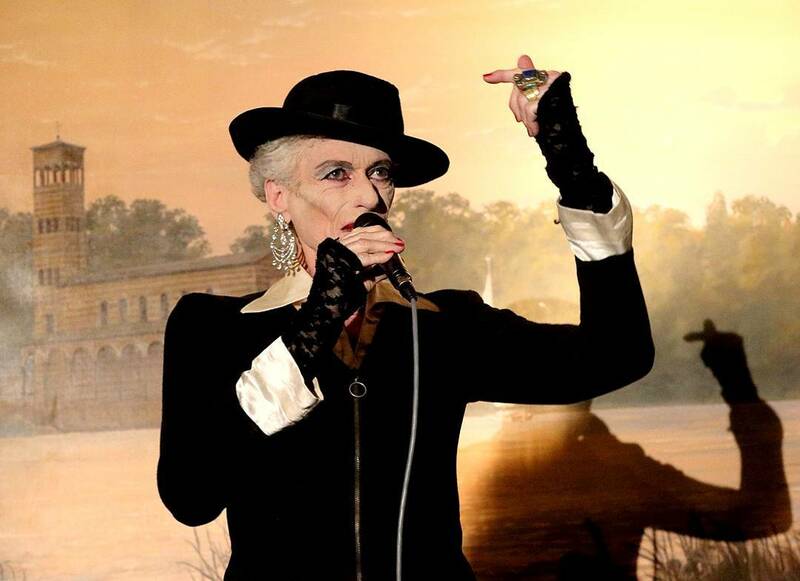 In addition to singing, I will talk about the Weimar Republic, the 1960s and the 70s—when I started to perform. I will also talk about the liberation movements that influenced me, including the first Gay Pride March in Berlin, gay centers, idols of the silent movies, theater ensembles like Brühwarm (Lukewarm) in Germany, and the Hot Peaches from NYC [a drag theatre company that would put on a political play a week]. I’ve been a FEMINIST from the first moment on. For me, Women’s Liberation and Gay Movements belong together! At the end of my show, I will try to talk about the fragility of freedom nowadays! Henrik: Tell us about gay cabaret in Germany. Dieter Rita: In Germany, a lot of things are included in cabaret: dance, poems, lectures, projections, gestures, paintings, silent movie excerpts—but also quite a few chansons sung with a pianist or with an orchestra. Songs are very important in cabaret. The public may even sing together with the performers. German audiences tend to like some kind of improvisation and the audience interacting with the artists. In Germany, the message often trumps entertainment. I’m happy to know that the Fringe also invited “Bridge Markland, my colleague from Berlin, as part of our ensemble performing with the Bearded Ladies Cabaret. Henrik: What are you doing professionally these days? Dieter Rita: At the moment I do different things, mostly as part of an ensemble. Together with the English-German theatre ensemble Gob Squad in Berlin, we will again perform Creation:Pictures of Dorian in November 2018. I got hired for a film shoot when returning from the US. As of November 12, I will also perform in Coming Society by Susanne Kennedy as part of the Volksbühne. Henrik: Which of your works do you consider the most important? 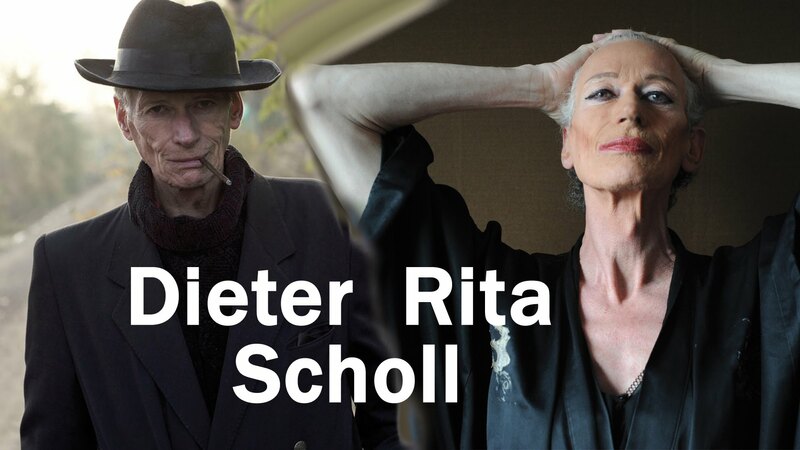 Dieter Rita: “Die Legende von [The Legend of] Dieter+Rita-WEST!” is a mosaic-like documentary about my queer life and work from 1979 till 2013. Parts 1 and 2 are available on Facebook. Part 3 exists only as archive material without commentary. It is a mix of shows, documentary films, videos, solo and ensemble work. It is available on the page of the Schwules Museum Berlin [The Gay Museum of Berlin], documenting the history of my engagement in the community, and to show my multiple faces as an actor/actress. I have also written DIVA—Between 2 Chairs, a play. Henrik: You have been called “the mensch with 1,001 faces” because of your capacity to transform yourself into different personas. Henrik: Is there anything else you’d like to share? Above all, as long as I can, I love to share my energy and do more film shoots. Henrik: If only your father could have understood the importance of your work in making our binary world more humane and more livable. Thank you, Dieter Rita Scholl, and your international and American colleagues for all that you do. As part of the Philadelphia Fringe Festival, Berlin’s Dieter Rita Scholl, together with 13 international theater artists and 7 musicians, will perform in Do You Want a Cookie? at 448 N. 10th St. at 7:30 PM. In addition, you can also see Dieter Rita Scholl with Gosia (Malgorzata Kaspryzcka) from Poland and Philadelphia’s John Jarboe on Sept. 13 at 10:30 PM in a special new program at the same location as part of Late Night Snacks. 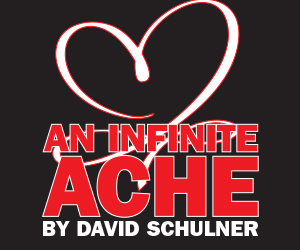 For details and tickets for both shows click the two links above.